The Fargo Times preceded the Fargo Forum and Republican. 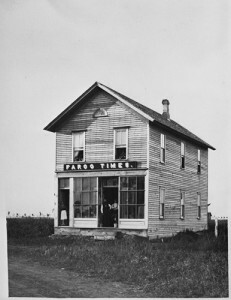 The Fargo Times’ building was a wood structure with multiple single-pane front windows that allowed sunlight into the press room. The gable roof stood out in contrast among the increasing number of flat-top and flat-faced business edifices in the area. The unpainted building had a large sign above its windows, allowing editor E.B. Chambers to signal a desire for his establishment to stand out and make a vertical mark on the vast and open prairie.